Bought some flowers at Trader Joe's for a painting demo on vases I was doing for my watercolor class this week. I was planning on just picking up anything since the demo was focused on how to handle the stems in the vase, but saw hydrangeas( one of my favorite flowers) and the ranunculus and decided to get both and make a little arrangement Arranged the flowers and got up early the next day while the flowers were still fresh and started this painting in oil in my studio. Did some more work on it later that night and then finished it up yesterday. This was one that really flowed, hence the name Joy. 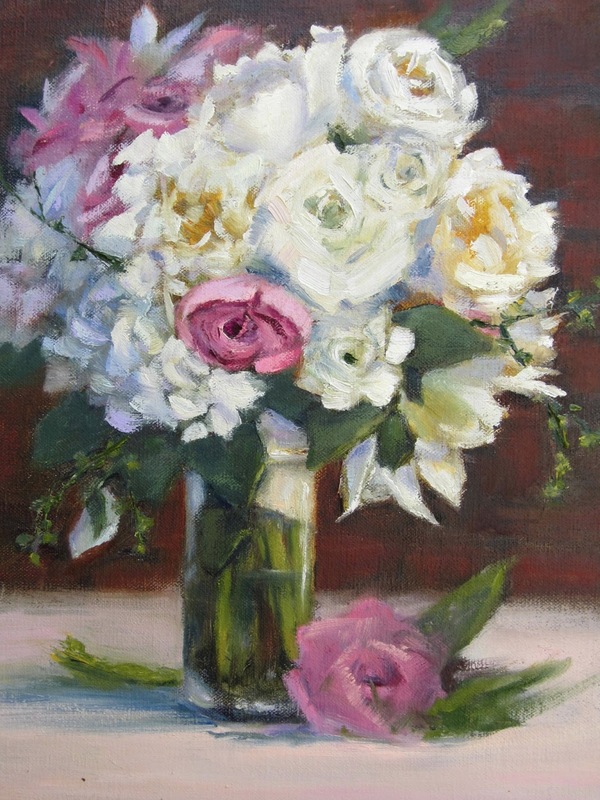 It was a joy to both arrange the flowers and paint them. If you'd like to learn more about painting flowers, there's a wonderful opportunity coming up in beautiful Highlands, NC at the Bascom. 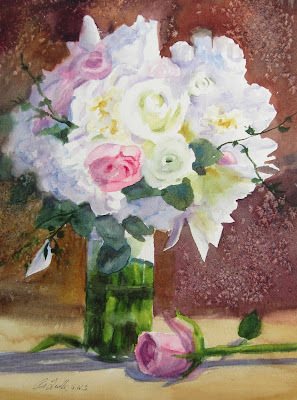 I'll be teaching a 3 day Painting Flowers in Watercolor workshop where we'll be painting from fresh flowers. It's Monday-Weds. May 6-8. For more info contact me or see The Bascom's website. To register you can contact Sara Hill at the Bascom at shill@thebascom.org. A scene from a small town in Tuscany. 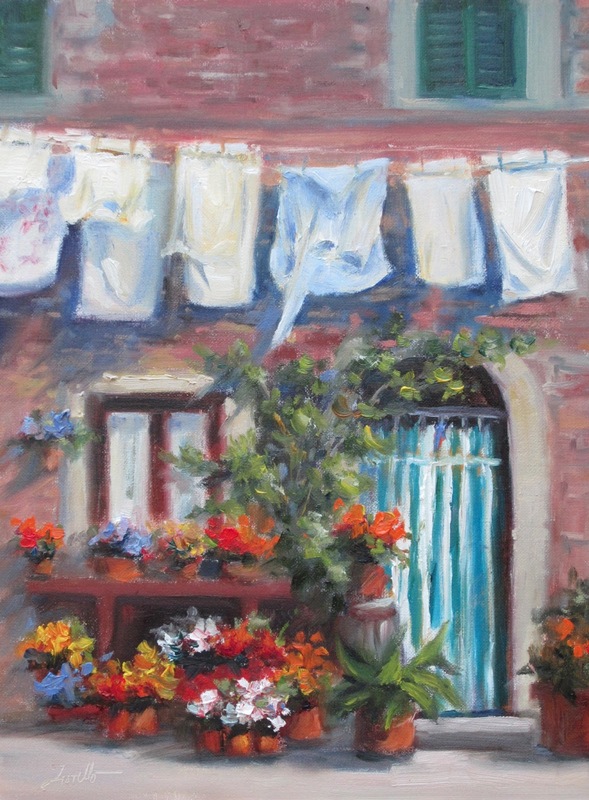 Since they don't have a backyard, everything hangs right out there in front- the container garden, laundry and all. I liked the curtain- maybe it's in place of a screen door to let the breeze in during the day. While I've been on this wedding theme, I decided to go back to my own wedding photo's ( from July 2000). This painting was inspired by the flowers that were on the tables at the reception-one of my favorite combinations- roses & hydrangeas. 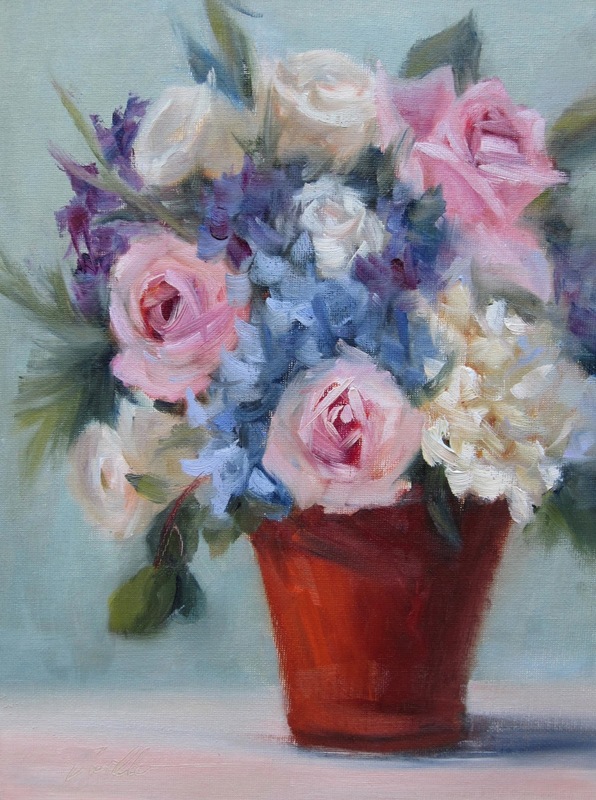 Since I've been at so many weddings lately, I'm using the inspiration to paint some flowers. This painting I completed yesterday is called "Wedding Day" and it was from my stepson Josh & his new wife Missy's wedding a few weeks back. I was very happy with how this painting turned out. ( Yes, it's true, not every painting turns out how you had imagined or hoped). Of course it helps to start with a beautiful inspiration- the light on this gorgeous and flowing display of flowers. I'm sure the personal connection of the excitement of the day and the joy in taking the photo's seeing the light on this beautiful subject add fuel to the painting process. 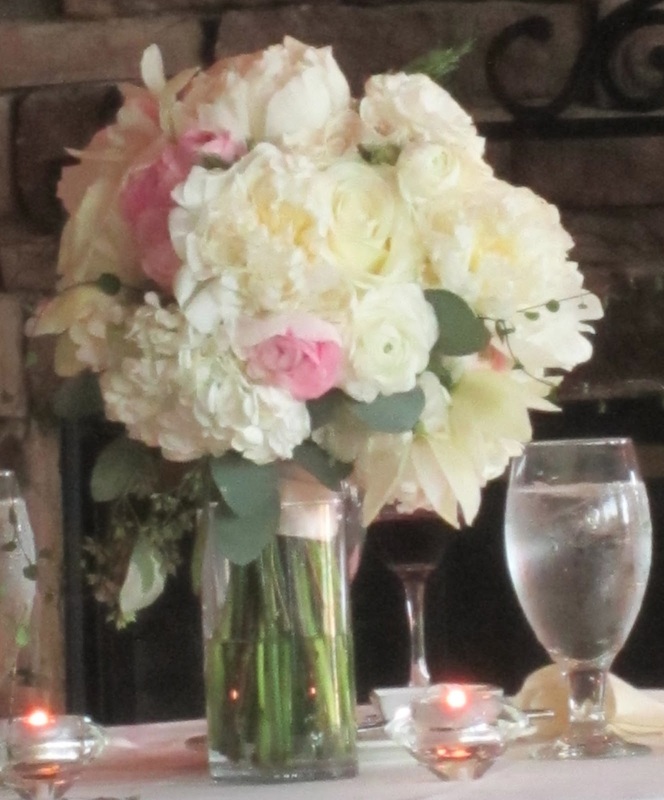 The flowers were exquisite, done by Anik Designs, http://www.anikdesigns.com/. If you have a need for flowers, you can reach Anik at 404-583-5028 or anik@anikdesigns.com and I'm sure she will do a spectacular job to make your day special, elegant and beautiful. I promised to share the watercolor version of the painting I posted last Friday of the wedding bouquet. Well here it is along with the reference photo and oil version. A few weeks ago, my step-son Josh got married. 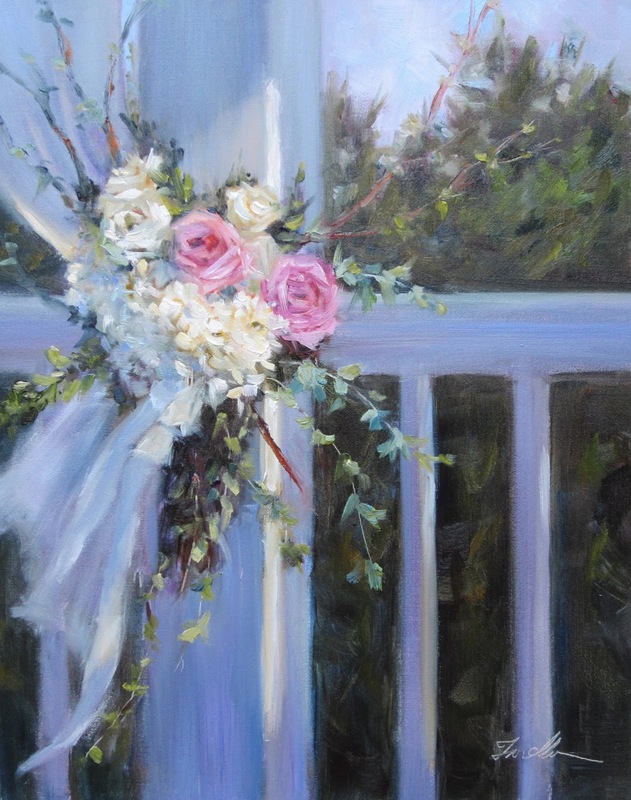 This is a painting of the bouquet that his beautiful bride Marissa( Missy) carried down the aisle. I haven't given it to her yet. Shhh... It's a surprise( well maybe not any more). Flowers can be complex, and white flowers are particularly challenging, but I was happy to work on a gift that I know will be a permanent reminder of their special day. Here's the original bouquet. I did a version in watercolor also and will post that next week. 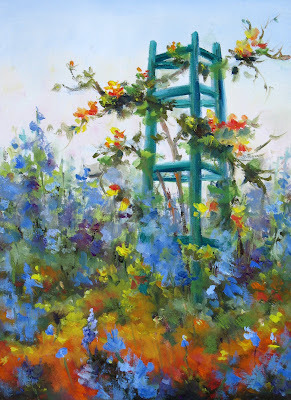 Every April, I head down to Callaway Gardens in Pine Mountain GA to teach a workshop and enjoy the emergence of spring. If you've never been, it's worth a trip and spring is the perfect time to see the colorful flowers, butterfly garden, go bike riding around the garden, there's lots to do. They even have a spa there now. It's a very peaceful place to get away from it all and spend some time enjoying nature. If you'd like to join in the fun, here's some information on the workshop which will be Saturday and Sunday April 20-21. For general information on the gardens, visit www.callawaygardens.com. There is a hotel associated with Callaway where you can spend the night. Feel free to get in touch if you have any questions. Hope you'll come out to play! Join instructor Pat Fiorello as we paint on location in the Gardens from direct observation of nature. One day will focus on painting flowers from a close-up perspective; the other will address painting flowers in a garden setting for beautiful landscape scenes. Students are free to paint any subject that inspires them at the designated painting sites. Both days’ sessions include demonstrations, instruction, critique and individual coaching. You may bring your lunch or go to the Discovery Café for Lunch each day. All skill levels are welcome. To register, call 706.663.5153 or email education@callawaygardens.com. This painting was inspired by one of my previous painting workshops in France. I am able to gather so much beautiful and colorful inspiration during these trips. I'm excited to announce that you can join me when I'll be returning to France to teach a workshop in Provence May 17-24, 2014. Provence is a beautiful place, but also special since that's the very first place I ever went on a painting workshop when I had just started painting ( that was 18 years ago!). Once I got immersed in that wonderful painting experience, I vowed to keep traveling and painting and have done so ever since. Although I've taught in other locations in France I have never been back to Provence, so now it will be fun to return as an instructor. There are also more photo's and an sample itinerary on the French Escapade website. This tour is designed to be an exceptional experience and we have limited the number of participants to a small group, so if you are interested, please contact me ASAP at patfiorello@aol.com. You can register to reserve your spot by contacting Jackie, with French Escapade, the company that will be our host in France. Her email is: contact@frenchescapade.com.